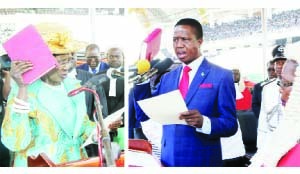 •Ms Wina made history when on January 26, 2015, she was appointed as the first female Vice-President of Zambia and she opened another chapter in Zambian politics when in August 2016, as a running mate to President Edgar Lungu, became Zambia’s first elected vice-president. The name Inonge Mutukwa Wina has become an extra ordinary name for an extra ordinary person. Born on April 2, 1941, Vice-President Inonge Wina has been extra ordinary in her trailblazing life that has seen her turn impassable pathways into feats of hard work glittering with excess golden virtues of honesty, humility, and wisdom among others. A contemporary widowed Septuagenarian, Ms Wina has and continues to draw accolades for her accomplishments in positively impacting the society she has served in eclectic positions.